Week five of The Writer’s Handful welcomes Ken Rodgers, a marvelous poet and prose writer, as well as a filmmaker and teacher. I don’t know Ken personally–he’s in Idaho, I am in Illinois, two states only close to one another in the alphabet–but I think I know that he is one damn fine guy. The writing I have read of his is wonderful, and he is a huge supporter of writers and the arts…the kind of man who creates good literary karma. It seems appropriate, too, that on Memorial Day, we spend some time with Ken. 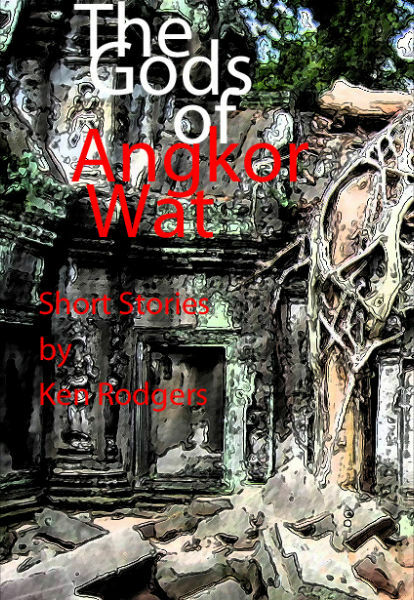 Visit his websites and read his books (The Gods of Angkor Wat available here) and you will see why, I think. Today I wrote on upcoming entries for the two blogs I manage at www.kennethrodgers.com and www.bravotheproject.com. I also edited one of the stories in my next e-book provisionally titled Ojo de Dios. I look at a moment like this as an opportunity to ponder my writing habits. I don’t write on a regular schedule. I generally write every day, but not in any given piece or genre unless pressed by deadline. I am guilty of being interested in multiple art forms. Besides writing fiction, non-fiction, poetry and blogs, I take a lot of photographs and produce and direct documentary films. I whore around a bit with art. The first thing I recall writing was a story about an alien visitor to earth and I think the story was titled “Gurgle.” I was eleven or twelve. I wrote earlier, but don’t remember what. My mother told me I used to write letters to a man she presumed were addressed to my father’s good friend named, “Ted.” In honor of those letters, I named my stuffed dog, “Ted Letter.” I couldn’t really write since I was about three when I composed these, but I was writing them nevertheless. I read a lot. Right now I am reading, for the second time, Shelby Foote’s monumental The Civil War. I am reading two books of poetry: Robert Wrigley’s Earthly Meditations and the western poet John Dofflemyer’s Gate Left Open. Both works are contemplative in nature, yet enlivened by the tools of the poet; sound and repetition, concrete imagery. I am also reading Harold Bloom’s Shakespeare, the Invention of the Human and The Portable Jung edited by Joseph Campbell. I am very interested in Jung’s notion of archetypes and the collective unconscious. As far as fiction, I am reading David Abrams‘ novel Fobbit, a satirical look at the Iraq War. I also read blogs, news, magazines and lots of posts in the internet, some of which fascinate me with their bilious nature. The most important advice I ever received was from one of my drill instructors in 1966 at the Marine Corps Recruit Depot San Diego, California . He said, “Keep your head down.” And I did when I fought in Vietnam even though now I usually keep it up so I can see what the hell is happening. If my writing was an animal, what would it be? That’s forcing me to think in terms of metaphor and even though I am a creative writer and need to think in metaphor and simile and metonymy and synecdoche, I rarely do unless forced. Let’s see…a sidewinder, a bison, a wolverine? Yes, a wolverine: sneaky and solitary and confrontational and vicious if needs be. From Ken’s website: “Ken Rodgers teaches and writes in Boise, ID. He has chased sheep across the desert, chased the enemy through the jungles of southeast Asia, run the head gate to capture cattle, pounded the keys of a calculator, pounded the keys of a typewriter, peddled mountain real estate, and tailed off recycled redwood at a finishing mill. An award-winning author, Ken explores the region where poetry and prose meet. His poems, short stories and essays have appeared in Idaho Arts Quarterly, Eagle Magazine, The Farallon Review, 34th Parallel, Ascent Aspirations, Switchback,VerbSap, Absomaly, Tiny Lights, Fiction Attic, Roman Candles, and other publications. He has an MFA in Creative Writing from the University of San Francisco. 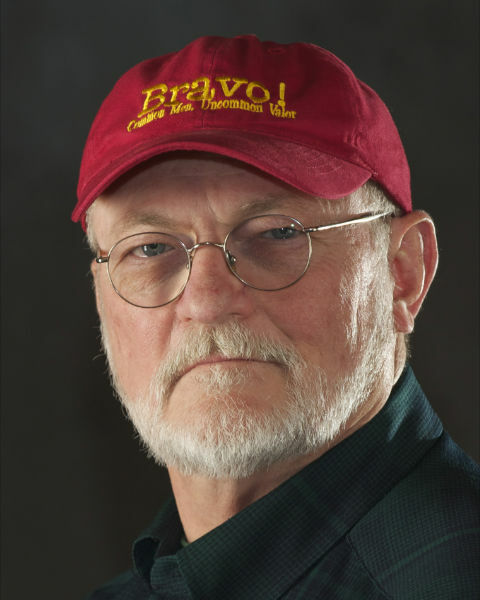 Ken was a Pushcart Prize Nominee, and was nominated for Poet Laureate of Sonoma County, California, as well as for inclusion in Best New American Voices. His first book of poetry, Trench Dining (Running Wolf Press), was published in 2003. Barstow and Other Poems, was released in 2008. His latest collection, Passenger Pigeons, is scheduled for release in 2010. He has performed his work in libraries, hair salons, coffee shops, book fairs, wineries, movie theaters, colleges, pubs, book stores, and on public radio and television. He has also juried several writing contests. This looks like an engaging Monday series–thanks! I enjoy meeting writers I haven’t met before so this was great. He seems an affable, smart man; I will seek out his writing. Thanks so much, Cynthia. He is indeed! The work is tough, but beautiful and moving.